Hull City Council, along with private-sector investors are supporting the ongoing regeneration of this dynamic and thriving European port-city, helped in part by being the City of Culture 2017, and innovative companies such as Space Architects. The development of the Ron Dearing UTC (University Technical College) began in July 2016 with the main contractor Sewell Group, and Space Architects, along with structural engineers, Billinghurst George & Partners, and M&E engineers YCEng Ltd. 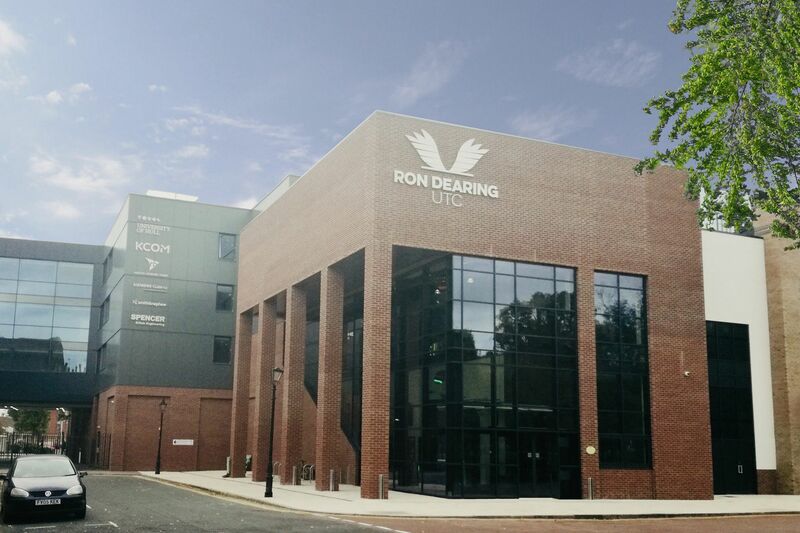 The UTC is named after Ronald Ernest Dearing, or Lord Dearing as he became, who was born and educated in Hull. He was the eldest son of a docks clerk and rose to become the Chairman and Chief Executive of the Post Office Ltd.
Lord Dearing changed the landscape of higher education through the ‘Dearing Report’ and helped to develop the UTC model - government-funded schools that teach 14–19-year-olds technical and scientific subjects in a whole new way. UTC’s are led by a sponsor University, in this case, The University of Hull, who, along with major businesses support the development of the curriculum and guide students to significantly improve their higher education and employment opportunities and fast-track them into the careers of their dreams. The majority of the UTC's governors and key members of staff are appointed by the University and include; Spencer Group, Siemens Gamesa, Smith & Nephew, RB and KCOM. By 2020, the UTC will have the capacity to educate 600 inventors, engineers, scientists and technicians of tomorrow and fill the skills gaps identified by these businesses. Even the student’s working day mirrors that of business, being from 8:00am to 5:00pm (unlike traditional schools or colleges). This UTC will specialise in digitally controlled mechanical systems including mechatronics and digital technologies - specialisms that mirror that of Space Architects. The £10 million cutting edge education project required the expertise of Space Architects including the interior design and Fixed Furniture and Equipment coordination, utilising the skills of Darren Purvis (Senior Interior Designer), and Mike Varlow as the Project Lead. Covering 5,000 sq metres, the Education & Skills Funding Agency (EFSA) brief for the project involved the demolition of existing buildings and the inclusion of a surface car park area adjacent to the recently completed Grade II listed Hull New Theatre; another project recently completed by Space Architects. Although the site was extremely tight, the familiarity of it was a benefit for Space Architects who, having worked on the theatre, could match the existing buildings on the square and the extension to the Hull New Theatre façade with the same pallet of materials. After examining the ESFA brief and facilities output specification, Space Architects developed the scheme using the RIBA Plan of Work to detail all tasks and output. Stages 2 to 6 were utilised for this project, beginning with Stage 2 which is for Concept Design which flows into Stage 3 of Developed Design. Stage 4 involves Technical Design which leads to Stage 5 – the Construction, and finally to Stage 6 of Handover. Space Architects developed a 3D Revit BIM model for the building which enabled the use of VR technology to show the client, stakeholders, contractor and new students, a virtual view of the project. Providing this technology not only allowed everyone to walk virtually through the building but gave the students an opportunity to see at first hand the exciting benefits of utilising digital construction methods. Mike Varlow said; “This was the first time we used VR for a client from our Leeds office. All participants in the project thought this was an amazing and excellent tool to preview the building and showed the students what can be achieved by using digital technologies. The building sits on stilts and has a sheltered external space with an under croft car park and over sailing of the service yard, which is shared with the theatre. It has a prominent ground level brick and glass main entrance on Kingston Square – a key location within the conservation area. The UTC is visible from all sides, including the dual carriageway ring road around the North East corner of Hull city centre where the elevations are clad in composite metal cladding, with a sturdy brick and glass corner tower to signpost the building. Space Architects were keen to take on a fabric first approach with high levels of insulation and thermal efficiency. Modern buildings should be sustainable and maximise the use of materials to reduce operational costs, improve energy efficiency and reduce carbon emissions. All this helps to address the performance gap that has dogged the construction industry for many years. The UTC is split across four floors with the ground floor utilised as a testing space and external social space with an open courtyard, providing both open and covered areas for the students. The first floor is reserved for manufacturing studies, design and technology, mechatronics workshops and the VR suite. The 2nd floor is the project planning area with big open plan collaborative spaces for students, and the 3rd floor holds the research level with classrooms for academic learning and the science labs. Developing the UTC to engage students in high-technology courses through state-of-the-art learning spaces and facilities required an in-depth understanding of the level of equipment they needed. The subsequent challenge following from this was the accurate coordination of power and data – indeed a challenge, but one that Space Architects solved because of the expertise and experience they have of using digital technologies in their day-to-day business. Part of the UTC’s curriculum involves students working on real-world projects designed by the sponsors. For instance, Siemens offer on-site education at their offices and facilities for building and developing projects in pure industrial settings. This unique approach to tailored education provides the skills and qualifications that businesses require to drive forward Hull’s economy. It will add a new dimension to the region’s skills agenda and be a role model for the rest of the country to follow.